gate, is a black-walled tavern. On weekdays, it’s as quiet as a church; but on weekends, music bursts out of its dark interior, cars line the street and patrons dance between them, holding beer cans and bottles. The gates of the clinic are not secured, so anyone from the tavern is free to wander in; there is but one security guard on the premises. This poses a significant risk to the patients and nursing staff of the clinic. Traditionally, the clinic opened from 08:00 till 16:30 on weekdays. 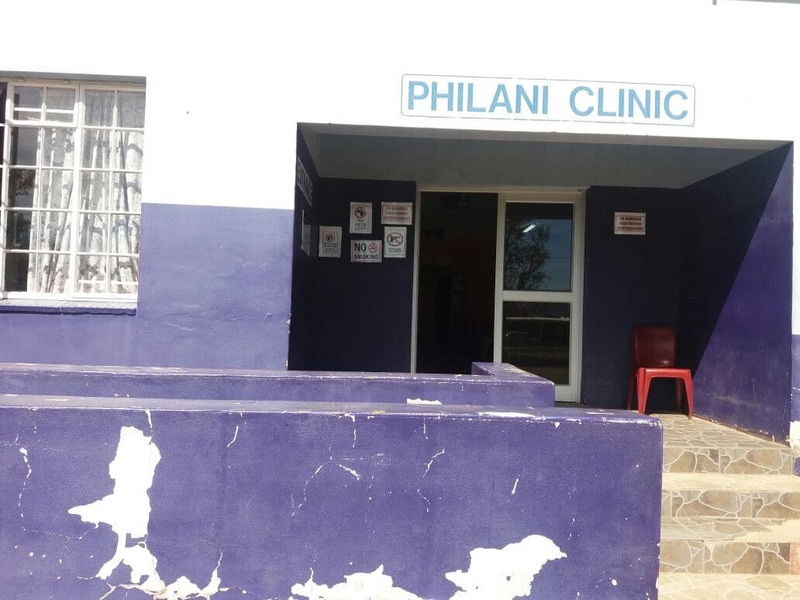 Since 2013, following a directive from then-MEC for Health Sicelo Gqobana, nurses at Philani Clinic were instructed by the sub-district manager, Nonceba Bhabha to begin working weekends and public holidays. The nurses have been forced to work on weekends without compensation, and this is taking a toll. Four nurses have resigned or been fired since this unilateral decision was handed down from the district office, leaving only eight nurses rotating shifts to cover weekends. On any given day, there should be three nurses at the clinic; because of staff shortages, only two nurses work on weekends. The nurses have questioned the decision to operate seven days a week, and have requested written confirmation from the district manager that this was indeed mandated by the department. A memorandum from the district manager to the superintendent-general confirms that the resolution to open the clinic on weekends was never signed. The sub-district manager did not respond to their requests. Instead, according to Sister Koti, pressure was placed on the operational manager. “She said we must comply, and complain later. She never gave us options for contesting this thing,” says Koti. Nurses at Philani Clinic report being subjected to victimisation from the district office. They have repeatedly asked their union representatives to intervene on their behalf, with little progress in resolving the issue. The clinic is over 100 years old, and badly maintained. Paint peels off the wall where damp is creeping up from beneath the ground. The foundation is reportedly sinking. A memorandum from the clinic committee states that there is often no water available; the clinic is equipped with a rainwater tank, which runs empty and is not refilled. The memorandum also cites insufficient equipment, including a fax machine that has been without ink for nearly five years. The clinic has been the site of contention in the last three years, with residents forcing it to be closed on several occasions. The reasons for the shutdown are numerous; clinic committee member Luyanda Nogemane places the blame squarely on the unresponsive stance taken by the MEC for Health, Phumla Dyantyi. He claims that Dyantyi has placed politically connected individuals at the district office, instead of people who care about the community. On 30 November 2016 the committee wrote a letter to Dyantyi, accompanied by 68 signatures. However, the matter remains unresolved. 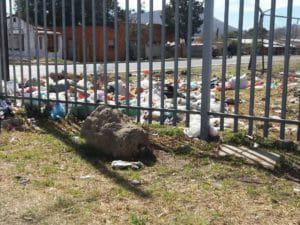 a rubbish dump right outside the clinic. June of that year, citing the non-payment of nurses as one of the key issues. “We took our grievances to Bisho, and met with Mr Myezo,” says Koti. The HR manager called a senior manager at the district office and was told that the nurses had been paid. He advised them to set up a memorandum of understanding between the nurses and the district, but this has not been put in place. 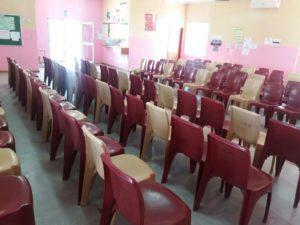 Instead, the district office issued notices stating that the nurses were off duty without authorisation, and began withdrawing money from their salaries – amounting to as much as R1 500 – if they did not report for duty on weekends. At that time, Eastern Cape Health Department spokesperson Sizwe Kupelo is reported to have said that payments to the nurses were not completed because the nurses had not submitted claim forms – but Sister Koti tells a different story. Staff morale at the clinic is at an all-time low. Those who remain are burnt out. Between the three nurses on duty, they serve approximately 200 people per day; and on the weekends, when there are only two nurses on duty, there is no clerk to receive patients, so this task must also be performed by the nurses. “We try not to let our issues affect the clients,” explains Koti. “Although clinic hours are 08:00 to 16:30, it is rare for us to leave at that time. We stay till after 6pm sometimes. We often don’t have time for lunch – forget about tea breaks.